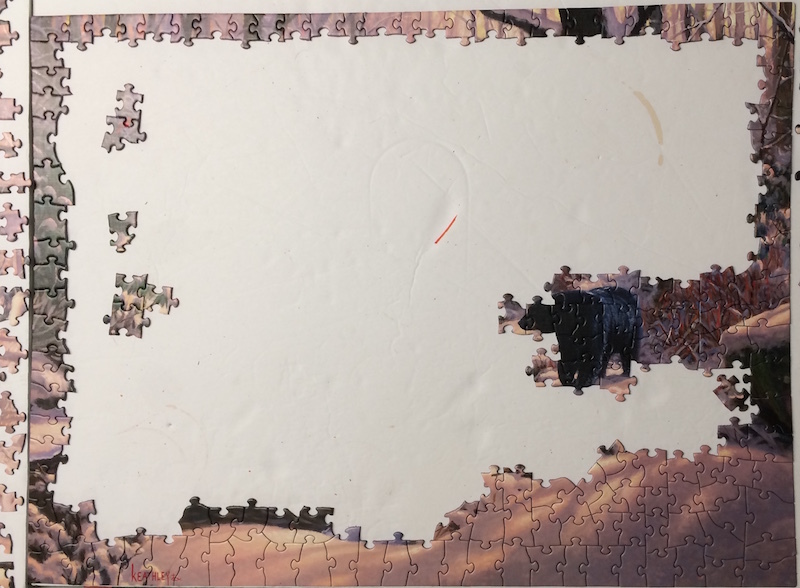 I started this puzzle out in my usual style with sorting according to colors – that’s when I noticed the brush strokes the most. It was quite challenging to decipher the image. Mostly I could see the paint brush strokes and realized what the situation was. I determined the only way to complete this one is by color-shades and shapes. I carried on with a plan in mind…..do only the dark colors first and work my way to the light colors…..that didn’t help much. I tried to focus on the 3 main areas I could separate from the background which was the snow, water-river and the bear. Then the rest was struggling a lot with the background trees, plantation and the 2 big, dark trees. And it took the bulk of the time. There was straining to see the shades and the shapes of the pieces were the best help available. Until finally the image magically appears completed and the paint brush strokes seem to disappear when viewing the image from a bit of a distance. But close up you can see them all. Now take a look at how beautiful the artwork looks. It is what attracted me to choosing this image in the first place. 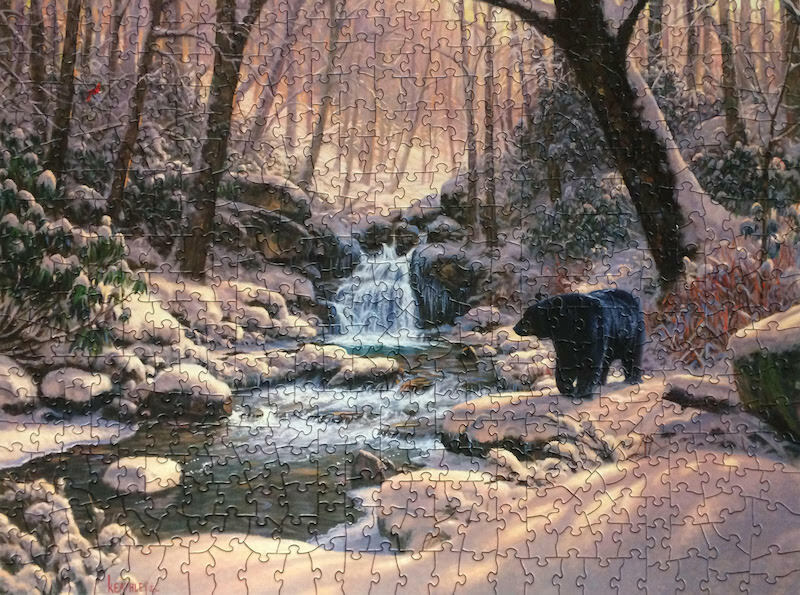 Other 500 piece jigsaw puzzles have been completed between 4-6 hours by me – this one took 12 hours and that is more than the average 1000 piece puzzles I have put together. 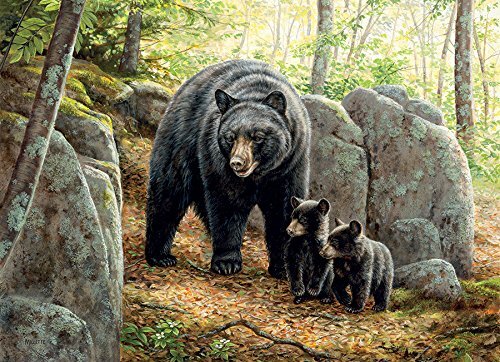 This 500 piece jigsaw puzzle from Cobble Hill Puzzle Company is titled Black Bear Brook. 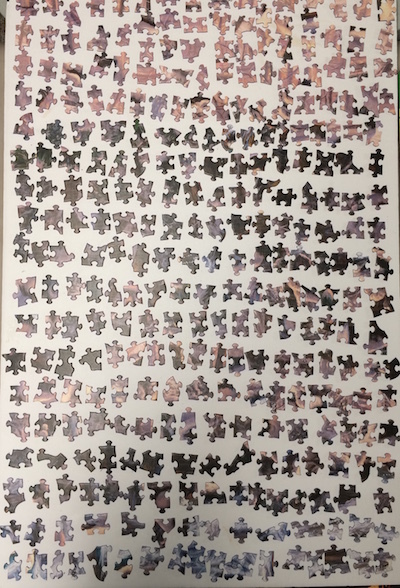 The size of the puzzle is 61 x 45.7cm or 24 x 18″ therefore the 500 pieces are in very large format. Makes for good handling with odd shaped pieces. 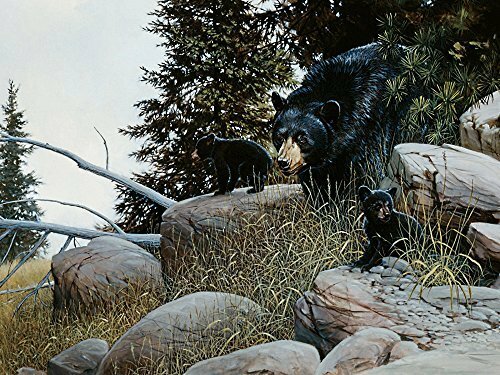 You’ll need that with this one because it is heavy with the Artist’s brush strokes and the assembly process will be completed mostly by shapes and shades. This makes the process more challenging than other puzzles. 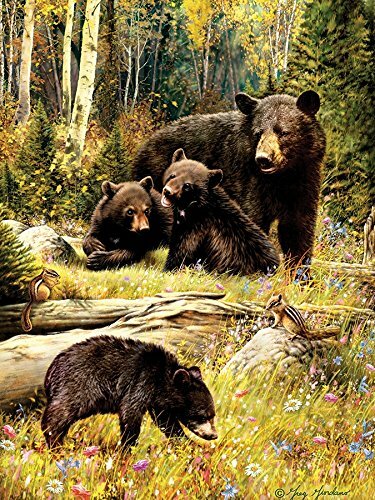 In fact, I rate paint brush strokes on jigsaw puzzle images to be just as challenging as an actual photograph image is. Depending on the image, both of these types can become very daunting, tricky and/or challenging – which works well for those who enjoy these types of puzzles – but they are not for every puzzler. 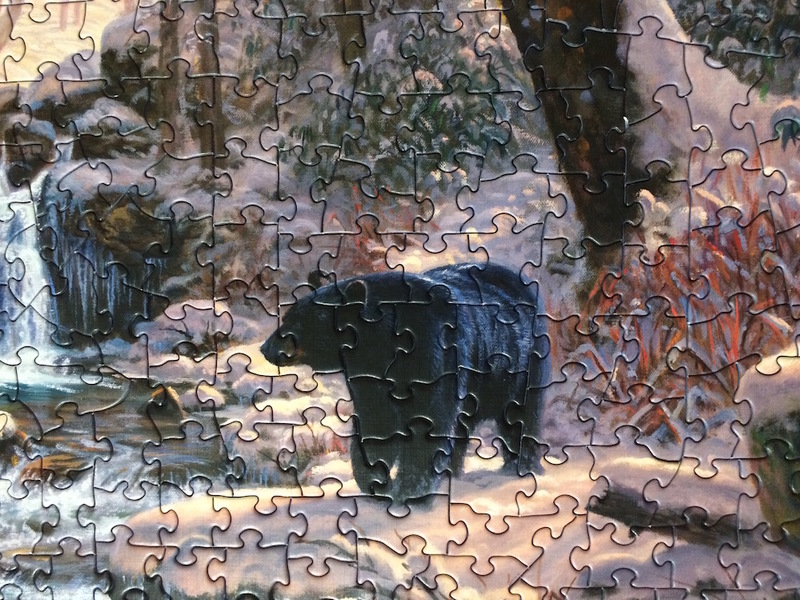 The next section describes some of the paint-brush-stroke situations associated with jigsaw puzzles. 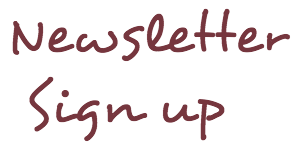 If you are interested in hearing about my discussion on that, read on but if not, please feel free to going back to doing your puzzle…..
Here’s the situation. 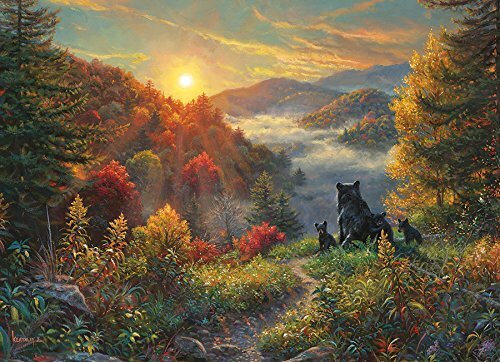 You see a beautiful image on the jigsaw puzzle box and think to yourself how lovely that would look framed on your wall. It matches beautifully with your furniture and decor. You’re pretty excited about your find and can’t wait to get home to get your puzzling hands on it. You cut open the bag and proceed with your usual style of puzzling and you notice that you are moving a lot of the pieces around…looking for a certain object….anything that is identifiable but nothing seems clear to you. Then you take a real close look at the image on the box and an even closer look at the puzzle pieces themselves. (Don’t be fooled by the ‘clear-er’ image when viewing or purchasing it online.) You have just discovered paint brush strokes are making up the whole image. All the pieces seem to be more like shades of color and there is no real clear cut objects on the pieces. Fear not….this is typical of some artwork (not all) where the paint brush strokes make up the ‘big’ picture. So you ask yourself….’How am I going to put this together if I cannot identify anything but shades of color?’ Well you just answered your own question – you will put it together by the shades of color and the shapes of the pieces. The good new is…..as you are assembling the pieces together you will see the image magically unfolding before your eyes only as the areas become filled in. You’ll step back and see the image on the box. 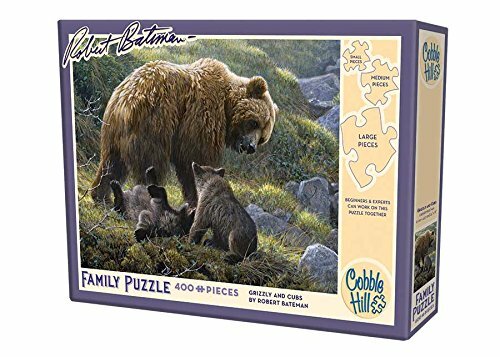 However, it may be more challenging to work these paint brush stroke jigsaw puzzles as the brush strokes tend to blend into each other (obviously) to make the actual image. 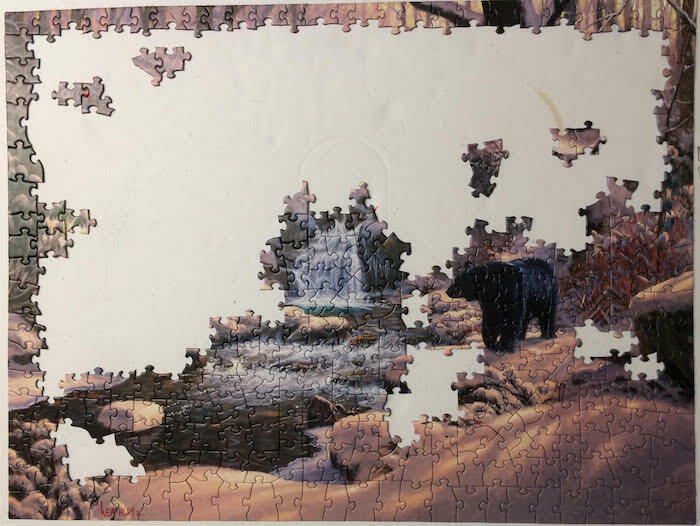 The artist is not painting the image specifically for the jigsaw puzzler but the jigsaw puzzler wants to assemble the beauty of the Artist’s image. After all is said and done, when you are choosing these beautiful works of art, the buyer cannot always tell instantly what the pieces on the inside are going to look like. 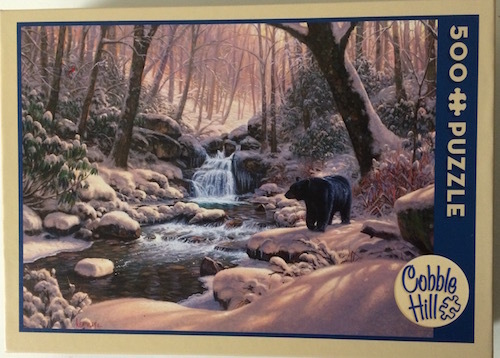 There are many types of painted puzzles out there – we see them all the time. So how can you tell if the image is going to have prominent brush strokes especially if the box is sealed? Get to know the Company brand and/or the artist of the image. If you were to try a new Brand that uses some Artist’s work that is heavy with brush strokes you may become disappointed with the Company itself rather than just this specific image. 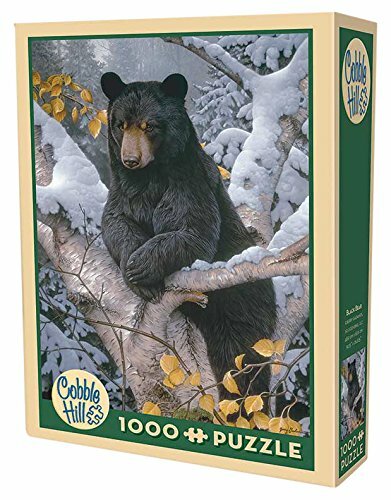 You may miss out on so many other great puzzles just because of this one experience when in fact they produce many other wonderful puzzles that are not heavy with paint brush strokes. I have heard this happen more than once. 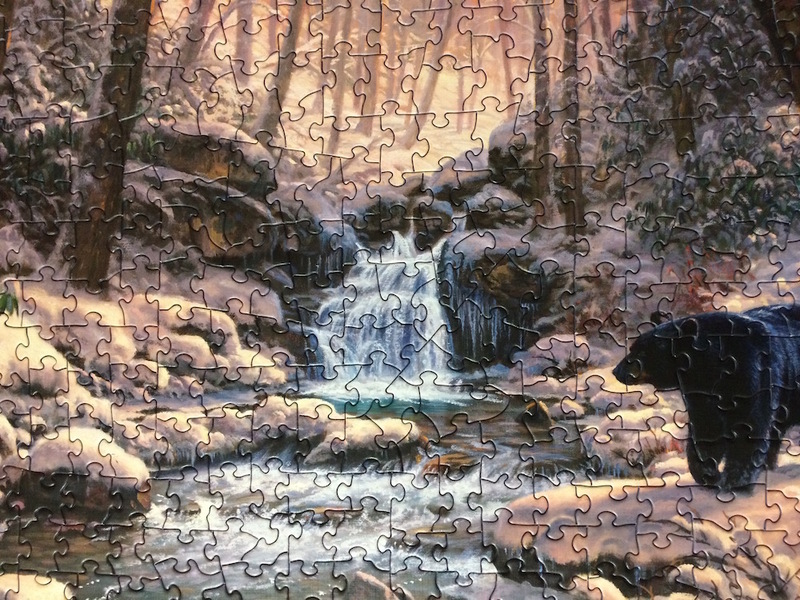 It’s especially daunting to the ‘newbie’ to puzzle these types and can discourage or turn them off instantly if their first experience is this particular situation – they say, ‘puzzling is just too hard’ when in fact it is the beautiful image they chose that is heavy with paint brush strokes rather than a simpler version of a puzzle image. But, when you are working to complete it, you will see a beautiful piece of canvas artwork unfold almost unseemingly yet delightfully right before your eyes….though it will not happen easily – so IF you like a smaller version of a challenging and tricky puzzle image, then paint brush stroke artwork is your kind of puzzle image and there are SO many superb artworks available to you.